Lionsgate Home Entertainment has just entered the 4K Ultra HD Blu-Ray ring with their official launch line-up. Sicario, The Last Witch Hunter, Ender’s Game, and The Expendables 3 will be available on March 1, timed to the first Ultra HD Blu-ray players’ market availability. After seeing some 4K Ultra HD Blu-Ray content at CES first-hand courtesy of the Blu-Ray Disc Association, I have to admit that the improvements in picture quality are truly striking. While offering four times the resolution of regular Blu-Ray presentations, it is mostly the HDR features that set 4K Ultra HD apart, giving image incredible detail and never-before seen colors. Each of Lionsgate’s 4K UHD release will be a combo release, also containing a Blu-Ray and Digital HD copy and will contain all previously released special features. 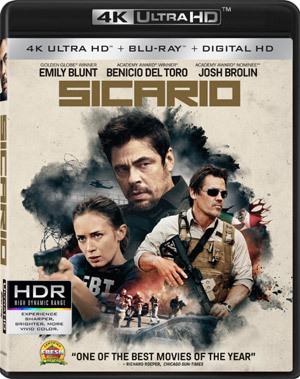 “Sicario” and “The Last Witch Hunter” will be available at the suggested retail price of $42.99. Being catalog titles, “Ender’s Game” and “The Expendables 3” will be priced at $22.99.